The National Acrylic Painters` Association was formed in 1985. It evolved from the concept that acrylic paint is still largely unrecognised in its own right. Oil and watercolour paints started from the same premise, with the origin and the history of each giving them distinct characteristics and goals, as well as their own organisations and societies. It should therefore follow that acrylic paint should have equal status as a new and developing medium. Acrylic paint is the 20th Century`s positive contribution to painting. It is the only medium that is capable of the widest range of approaches in technique and methods, thus stimulating creativeness and fresh thinking in theory and art ideology, and as such demands that maximum expression should be sought through its versatility. It was intended that the National Acrylic Painters` Association should fulfil this demand, by being a vehicle for collective exhibitions, which aim to promote the excellence and innovation of the medium. The first President of the Association was Adrian Henri. He held the post from 1986 to 1991, after which he became its first Fellow and a patron until his death in 2000. Adrian was an excellent president and a keen and loyal patron of the Association, believing in its purpose right from when Ken Hodgson founded it in 1985. Adrian was an acclaimed international painter and poet. A Mrs Kay Greenwood-Casey POA (France), an art, drama and opera critic was until her death in 2002 a patron and a loyal foundation supporter of the Association. The present President is the internationally acclaimed painter, writer and broadcaster, Alwyn Crawshaw. He having been Vice President from 1986 took over the post when Adrian retired and Dr Sally Bulgin took over his position. She was in post for some years until she stood down due to pressure of work. She was succeeded by Professor Arthur Hughes, who was until his early death in 1999, head of Art at the University of Central England. At present no one has been appointed to the post of Vice President. The present patrons of NAPA are Dr. Sally A. Bulgin, editor of The Artist Magazine, The Master of the Fine Art Trade Guild, and Dr Catherine Marcangeli. Recently a Mr Ken Martin a notable Liverpool architect has become a member and a patron of the Association. Since the inaugural exhibition in December 1985, there have numerous international exhibitions held at prestigious venues such as the Royal Birmingham Society of Artists Gallery, the Westminster Gallery (London), and the Durham Art Gallery. 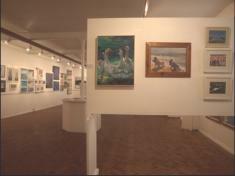 From 2002 until 2006 the Annual International Exhibition was held in St Ives, Cornwall, which is the acknowledge centre for art in Britain. This was mounted at the Mariners Gallery, which is right in the centre of St Ives close by the Tate Gallery. All the exhibitions were well received. In 2007 NAPA exhibited in the beautiful picturesque town of Ludlow and last year at the Obsidian Gallery, Stoke Mandeville, Buckinghamshire. This year NAPA is to hold its annual exhibition in Matthew Street, Liverpool, which is the located in the heart of the Cavern Quarter of the City centre, The home of the Beatles and Mersey Sound. 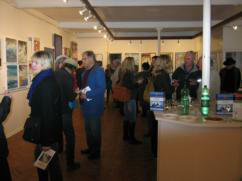 It\'s being held at the View Two Gallery. In addition to the Annual Internationals at St.Ives NAPA other shows were arranged. NAPA has held exhibitons at St David`s Hall Cardiff, South Wales. A major and prestigious show was held in 2004 at the spacious Williamson Art Gallery and Museum, Merseyside. This is a local authority venue, second only to the Walker Art Gallery in Liverpool. As a result of the excellent exhibition that was mounted on that occasion the gallery curator promised that future periodic shows could be mounted at this venue; the next one being in 2010, which will coincide with NAPA`s 25th Anniversary. Over the years other shows have been held at various locations up and down the country, places such as the Black Sheep Gallery (Hawarden Castle, Flintshire), and Rooksmoor Gallery (Bath). Members` individual and joint shows since NAPA`s inauguration have been mounted by Associates at venues of their choosing and endorsed by NAPA. Since its beginning NAPA has been supported by various companies who have donated a variety of prizes of material nature. The Association has received awards from: Art Review, Artists & Illustrators` Magazine Ltd., Artists Newsletter, Daler-Rowney Ltd., Forsline & Starr International Ltd, Great Art, International Artist Magazine, Liquitex UK, Modern Painters, Pro Arte, R.K. Burt & Co. Ltd. (Fabriano), Royal Sovereign Ltd. (Rembrandt), Spectrum Oil Colours (Spectracryl), St Cuthberts Mill, Thames & Hudson, Global Art Supplies (Golden UK) - formerly The Artist, The American Paint Co. Ltd. (Golden), Tollit & Harvey (Canson, Goldline, Isabey) Winsor&Newton and Colart (Winsor&Newton/Liquitex) and Harper Collins. NAPA associates with the Voluntary Arts Network and members can be listed in the Art Trade Press publication - Who`s Who in Art, and seek copyright protection via the Design and Artists Copyright Society. NAPA is a member of the Fine Art Trade Guild. The Association has further received substantial coverage in art journals and magazines, in Britain, but also Europe, America, and Australia. Membership is international and it includes artists from America, Austria, Belgium, Brazil, Israel, and Portugal. At the NAPA’s Annual Exhibition in 1995 the concept of a NAPA USA Division was discussed and Linda Gunn an American member was given permission to formulate a forum for acrylic art in America. On the 1st December 1995 an American Division of NAPA was established and Linda became its first Director and a Gerald Brommer NAPA NWS, became its first Honorary President. Gerald is a highly respected international workshop instructor, juror and author of several art books. A Sandra Carpenter, the editor of The Artist`s Magazine (USA) held the post of Honorary Vice President. Annual Open Exhibitions since its beginnings in the USA have been held. There are now two organisations in the states owing their beginnings to NAPA UK - they are known as ISAP and ISAP (Florida), which I understand is to revert to NAPA once again. The National Acrylic Painters` Association is a professional organisation. Professional is taken to mean that it accepts as members those persons who either earn a regular living by painting, or those who although not living by art, adopt a professional attitude toward the subject, exploiting creatively the acrylic medium, using experimentation and imagination. It welcomes all painters be they traditional or modern in their approach to art, and artists are accepted solely on the strength of their expressed work. The Association is lastly non-discriminatory concerning age, disability, gender or race.